Ray Scott’s big smile might be because his campaign is being boosted by lots of money from big corporations based outside Mesa County. 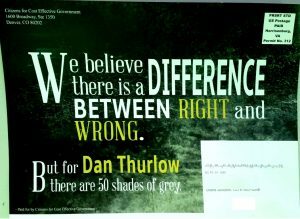 A new campaign mailer arriving in people’s mailboxes takes digs at SD-7 candidate Dan Thurlow in an effort to boost Colorado Senator Ray Scott (R-Mesa County) in the primary election this month. The other $20,000 of CFCEG’s funding comes from the Colorado Apartment Association based in Denver’s Greenwood Village, not in Mesa County. So why are Denver-based businesses pouring money into helping get Ray Scott re-elected? Because Scott reliably does their bidding instead of that of Mesa County constituents, whom taxpayers pay him to represent; because Scott brings bills that benefit oil and gas drilling companies, sponsors bills to hobble renewable energy and repeal sustainable energy requirements; because Scott has been a reliable chair of the Senate’s “kill committee,” where the Senate Republican leadership sends bills to die that might benefit average working people or the environment; because Scott brought a bill to force Colorado’s Energy office promote fossil fuels — the opposite of the office’s original intended purpose — and because when Senate leadership needs Scott to lay low and waste time, Scott brings bills with no pressing need and that no one in his district asks him for, like a bill that lets people mount their rear license plates somewhere other than in the exact center of the backs of their cars, or a bill to create a Scottish-American license plate. 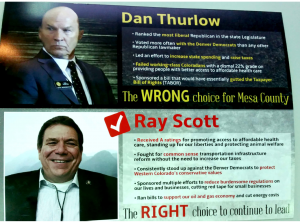 So if you want Denver to rule Mesa County, vote for Ray Scott, because that’s what is happening already with him in his Senate seat. ← Wondering who to vote for for Mesa County Clerk and Recorder? This one’s EASY. Yes pull back the curtain and they are ALL; CITIZENS FOR A CORPORATE GOVERNMENT! Our Democracy is on life support, we better get out there and vote with some discernment if there is any of that left after the media blitzes!! They have no clue what public service is about nor do they care.